Hiccups frequently occur by cause of contractions of your diaphragm muscle. Hiccups are sudden and happens for a lot of reasons like drinking alcohol or carbonated drinks, eating too fast or too much, laughing too much, sudden change in temperature. Fear or excitement is also known to cause hiccups. Anything that irritates the nerves that controls the diaphragm muscle, which controls the breathing process cause hiccups. When you start getting hiccups, a glass of water can shock your body and will stops them instantly. Drinking water upside down position will be more effective. Look up in the sky and pour some water into your mouth. Hold on and bend forward like head down and drink water slowly in three or four sips. Don’t drink all the water at once. That’s all you should do it! Wait a minute then see that your hiccups are gone. Just gargling with water may help you to get rid of the hiccups that are worrying you. If these hiccups have been troubling you since long then you can gargle with ice water for better results. Vinegar is another effective way to stop hiccups. Swallow 1/2 teaspoon of vinegar, with a glass of water. Its sour taste helps distract the mind, which helps stop the hiccups. Try any kind of vinegar. Inhalation and exhalation are the best ways to put an end to the continuous hiccups. Inhale as much air as you can and hold your breath for 10 seconds. Now exhale slowly and gradually. Repeat this for three to four times and you will see that your hiccups have naturally stopped. Cure Hiccups in Seconds with Apple cider vinegar. Slowly sip a glass of warm water mixed with one teaspoon of vinegar. Works better when the water is drunk from the far side of the glass. Blowing a balloon or a paper bag will help you to concentrate in breathing out. This will disturb the nervous system and hence, your hiccups will automatically stop. You can blow three balloons or bags and you will forget about the hiccups. 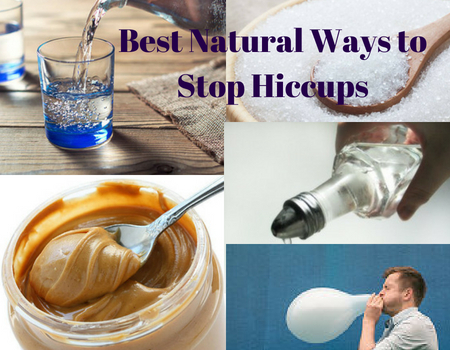 Most cases hiccups can be cured or resolve in a short time without any treatment. If hiccups last more than three hours or if they bother you’re eating or sleeping habits, you may need to contact your doctor.